Most of the houses which now line the Canal are named after the original families who first settled here and grew this great city. Taking a trip down the Canal is like taking a trip back in time. And while it is an essential thing to do while in Venice, it doesn't mean spending a pretty penny, renting out a gondolier for an hour or taking a cheesy river cruise. Since Venice is a city built on the water, there are no roads and the only way to get around is via water buses called the Vaporettos. A 1-day pass for the Vaporetto will cost you 20€, or a single 75-minute ticket is 7.5€. For the purposes of this tour a single ticket would do you just fine if you plan on walking your way around the rest of Venice for the day. While they might not look as elegant as the gondolas, they take the very same route and pass by all the same iconic landmarks for a fraction of the cost. Set out as early as you can manage. Venice is a busy, busy city and the earlier you start your day the more you'll have the city to yourself. We're staring our tour at the Northern most point of Venice, at the Ferrovia Scalzi Terminal, and traveling east along the Grand Canal. Get a seat near the edge of the boat to get the full view of the wonderful scenery. Watching the buildings pass by as you cruise along the river is like being transported into another world of fantastical architecture and ancient designs. I've included a googlemap of all the landmarks at the bottom of this post so you can follow along as you go. Come with me now on a tour down the Grand Canal. The Scalzi Bridge is the first of three bridges you'll pass under on your tour of the Grand Canal. 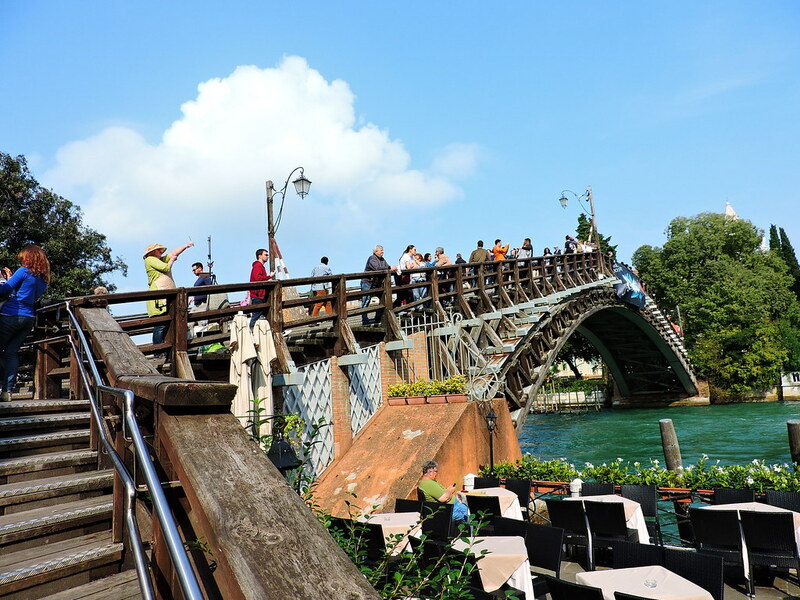 While there are dozens of bridges to be found throughout Venice, there are only three which cross the extremely wide Grand Canal. The Scalzi Bridge is thin and is one of the more modern designs along the river. The original bridge built here was called the "Austrian" bridge and was built of iron. The stone replacement is much higher and allows for larger boats to pass underneath. As you continue along the canal you'll pass the back end exterior of San Geremia Church. Its stunning white dome with slim silver cross atop is one of the landmarks of this little area of Venice. This church was built in 1753 and houses the remains of Saint Lucy. The layers of architectural styles and colours on this church make it look like a layered wedding cake. So many houses and palaces along the canal don't have special names or histories but each one has a definitive character. Venice has always been an influential place for artists. As such the use of colour throughout the city is always extremely present. It's hard to find a single dull building in the entire place. Residents decorate their faces with brightly painted wooden shudders, fantastical balcony flower boxes and stunning wrought iron designs. Below is the Fondaco dei Turchi, once the seat of Venice's Turkish population. Originally built in the first half of the 13th century, it is a perfect example of Byzantine design. rich use of colour and intricate stone work was of the utmost importance in Byzantine design. In the 17th century the vast majority of the Turkish population turned this building into a one-house-ghetto that housed hundreds of people as well as served as a warehouse and market for Turkish traders. Today it is the home of the Natural History Museum of Venice, which features a beautiful collections of flora and fauna, fossils, and a small aquarium. A feature which many of these Venetian houses have is the open porticos along the river's edge which allow boats to pull right up to the interior of the house. Like a Renaissance version of a garage. Continuing along the Northern portion of the canal we pass San Stae. San Stae was built in 11th century and was once a rather subdued and unassuming building. But in the 17th century it was renovated by the Swiss master Domenico Rossi. Its powerful and striking baroque statues which cover the facade are unique due to their active forms which jump and leap out of their marble prison and give great life to this unassuming and otherwise small church. Right next to San Stae is the Ca' Pesaro. The Ca' Pesaro was once the residence of Leonardo Pesaro, to whom the building is still named after. Ca', you'll hear this word frequently throughout Venice. Ca' is short for 'casa', the word for house in Italian. This building is uniquely designed with repetitive and heavy use of pillars that adorned the entire building. Building started in 1659. The architect was inspired by the chiaroscuro style of painting being employed during the Renaissance. Chiaroscuro is the use of strong contrasts between light and dark. Here the architect used that same dramatic effect with his arches and columns. Creating an unmissable effect to any passers-by. The Pesaro family has turned its residence into a wonderful museum dedicated to 19th and 20th century paintings and sculptures which you can view today. It is only of the most impressive collections in Venice and highly recommended if you're here for a few days. While floating along the river you'll pass by various less opulent, black gondolas being operated by men in simple black and white striped shirts. These are called 'Traghettos'. Inside these gondolas are business men, local, residents and even some tourists. These are not the tourist gondolas which go for hundreds of euros an hour, these gondolas cost only €2 and will take you across the large stretches of the Grand Canal which don't have a bridge large enough to cross over. Otherwise you're stuck walking around which can take a significant amount of time. So if you're in a rush or just too tired to go the long way around, these little gondolas are the ticket! Plus, if you're looking to experience riding in a gondolas without paying a ton of money, this is how you can check that box off your bucket list. The Ca D'oro is one of the most fantastical buildings on the canal. The pale, multicoloured marbles along the facade makes it looks like a softer water colour paiting floating on the river. Ca' d'Oro means 'House of Gold' as the facade was once covered in a thin coating of gold leaf. The palace was originally built in 1428 for the Contarini family, who were basically the royal family of Venice in the 14th century. This palace features some of the best Gothic architecture in Venice. In Venice, gothic architecture wasn't as dark and severe as it might have been in England or even on the mainland. In Venice, Gothic architecutre was more floral and leaned towards the Baroque. 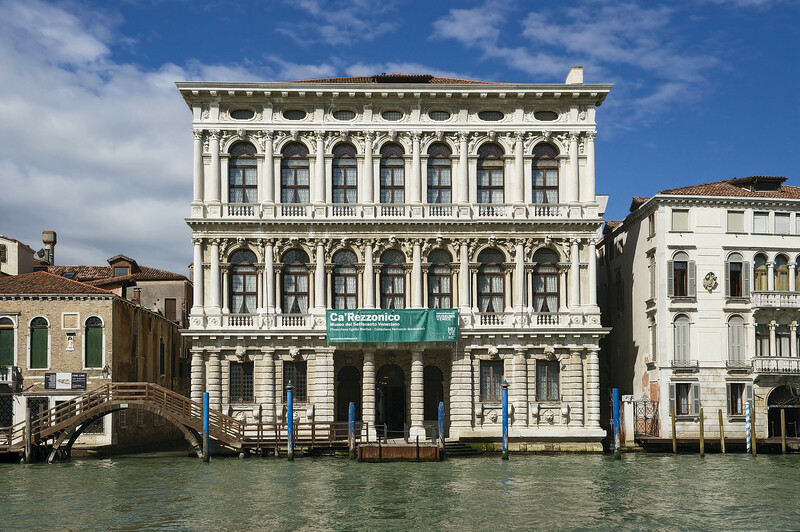 Today the palace houses the Galleria Giorgio Franchetti. The Gallery is a collection of art from the Baron Giorgio Franchetti. He donated all the works he had accumulated over the year to this public gallery to be enjoyed by the public after his passing. The facades in Venetian architecture are one of the best ways to identify which period the building was made in. Byzantine houses featured thin, horseshoe shaped arches with simple motifs on the capitals. Gothic houses have intricate rib traceries on top of their arches (as can be seen in the Palazzo Morosini Brandolin below) along with quatrefoil designs. Renaissance houses are simpler with bold projecting roof cornices and wide arches. Finally the baroque houses have circular headstones, and cherubs carved into the windows along with a bold use of ornamentation. The old Venetian Marketplace still stands today and even still serves as one of the major places where Venetian locals shops for their every day groceries. You can spot the market easily along the River, just look for bright red drapes hanging behind wide white arches. These protect the food from inside from the weather. The building was originally a Gothic construction but the newly renovated design was made in 1907, but still preserves much of the original architecture. If you are close enough, check out the carved capitals on the end of the arches, each one is carved in the shape of a sea or sea creature since the main source of the market's income both now and when it was first built was the freshly caught seafood from the ocean. The Rialto bridge is the oldest bridge in Venice. It was built by Antonio da Ponte in 1591. Its repetitive and powerful porticos that line the top of the bridge was a point of contention amidst Venetian architects of the time but now the Rialto Bridge is one of the most iconic images of Venice and it is because of its unique and daring design. If you arrive early in the morning you might see the bridge in all it's architectural glory but as the day draws one thousands of tourists pour onto the bridge and it is packed to the gills, making some of the details hard to make out. Another great reason to come as early in the morning as you can manage. Since Venice was such a wealthy city for many many years, hundreds of merchants flooded the city. Many of these merchants were foreigners and in 1228 a building was constructed to house all the "German" merchants. Despite the name, the merchant house included Poles, Czechs, and Hungarians all who traded goods inside the walls of Venice. This building was like the New York Stock exchange of its time. The sound of angry, loud and boisterous traders often flooding into the Grand Canal. 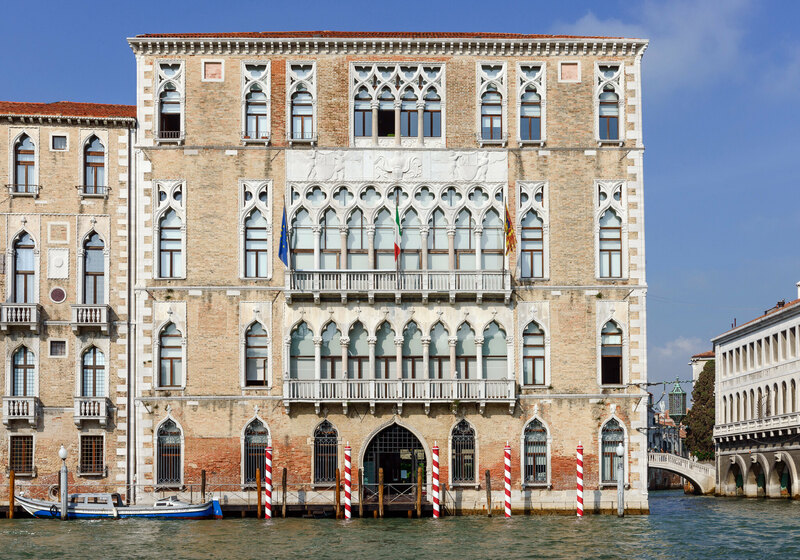 My favourite building on the Grand Canal is the Palazzo Barbarigo. It was originally built in the 16th century and features an intricate mosaic applied to the facade. Each of the pieces of glass used in the mosaics were from nearby Murano, famous for its glass craftsmen. Photos cannot do justice to the way the light hits the colourful patterns and reflect off the water. The mosiacs were applied in 1886 when Barbarigo, who owned one of the glass factories in Murano, bought the property. He used the exterior of his house like a form of publicity for his incredible glassworks. In the famed St. Mark's square you can visit the grand Basilica whos entire interior features more incredible glass mosaics. Barbarigo was so inspired by St. Mark's Cathedral and took this inspiration into his own home. 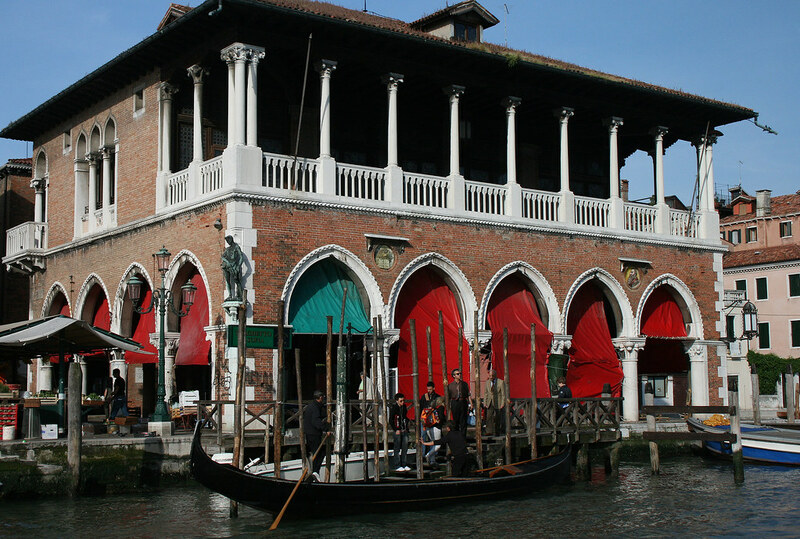 While travelling down the canal be sure to study the boat docks which many of the large palazzos have in front. Each one has their own colour scheme, making the entire canal a river of wooden rainbow bulrushes. The closer you get to St. Mark's square the more and more traditional gondolas you'll see travelling down the river with tourists inside. These large black gondolas are incredibly detailed with sumptuous red velvet interiors. One of the things that makes the Ca' Foscari so unique is that it has four floors, an architectural innovation for houses which are built on top of the water. It is designed in the Late Gothic style with a myriad of ornate windows. The tan brickwork in contrast with the white marble creates a beautiful juxtaposition against the blue sky. The Grassi Palace is a beautiful example of the modern and neoclassical coming together is become the future of Venetian architecture. In Venice, keeping the historical artistry of the canal is so important but if there is no progress and modernization the buildings will eventually sink beneath the waves. When the Fiat Motor Company bought the palace they did extensive restorations and renovations to bring the palace back to its once great glory while also ensuring it would last for another century or more. The enormous Ca' Rezzonico was built by two of Venice's greatest architecture in 1660. 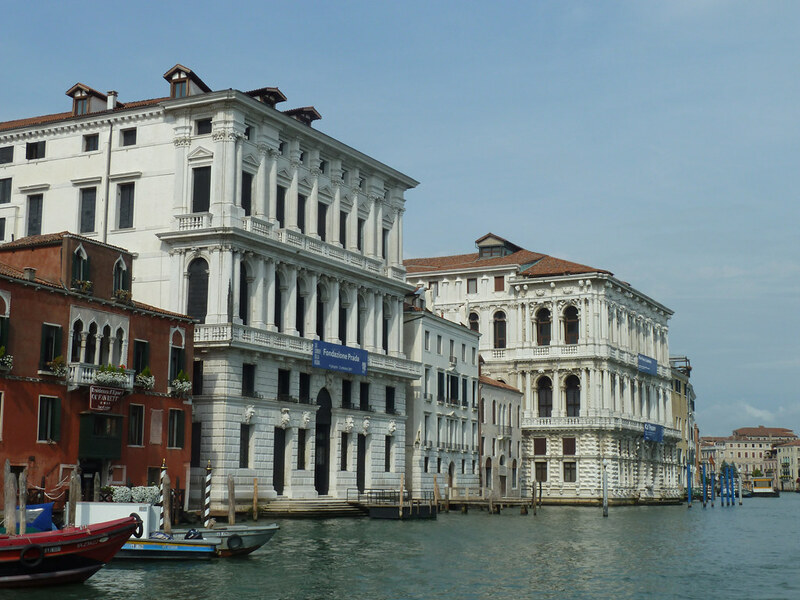 Baldassare Longhena and Giorgio Massari created the landscape of the Grand Canal and influenced architects both in Italy and all over the world. My favourite part of the building are the wide, oval windows on the top floor which resemble portholes on a massive ship. The building currently houses a fantastical museum where you can tour over 40 different rooms which replicate life in Venice in the Rococo period. Lush furnishings and elaborately designed fabrics make you feel like a queen, even for a day. There is even a reconstructed pharmacy which you can explore. The Palazzo Loredan is a gorgeous example of Gothic architecture. The facade is decorated with ogee arches and quatrefoil windows. The Palazzo was built in the 15th century and was the birthplace of two of the Doges of Venice. A doge is much like a European Duke oversaw much of the functions of Venetian society. The Palazzo Loredan became a hot spot for Venetian aristocrats and Mozart even entertained here. The Ponte dell'Accademia is the gateway into what I believe is the most scenic part of the canal. The first bridge which crossed this span of the waters was built as early as 1488 but the current wooden bridge design was built in 1933. While most bridges around this time were being built in the more resilient material of stone, designer Eugenio Miozzi insisted on using wood to preserve the more natural look which wood exumes. As you pass under the great Ponte dell'Accademia, you see one of the most iconic views of Venice. On the left side of the Canal is the Palazzo Cavalli-Franchetti. The building is painting sunflower yellow and it absolutely glimmers against the blue sky and teal waters. The palace was built in 1565 and is one of the most incredible examples of Venetian Gothic architecture. Today the building houses various exhibitions and congresses. Coming around the bend you approach the bright accented Peggy Guggenheim Museum. Although this building now contains Venice's seminal modern art museum, it was once the home of famed art collector Peggy Guggenheim. Peggy adored Venice and curated the art in her home not to please the rich and uppity art crowd, but to please herself and her family. The collection feels so personal while also containing some incredible pieces from famed artists of the 20th century. As we approach the great St. Mark's Square we pass the bright white shining gem of the end of the Canal, Santa Maria della Salute. The grand double domed and octagonal design makes it stand out from the other churches along the canal. The church was built in memory of all those who died during the great plague of 1630. The church was designed in the baroque style by Baldassare Longhena. Since the church was built in response to the plague, much of the art references Death. The contrast between the darker subject matter and the bright white stone and marmorino brick is a stunning juxtaposition. The facade is decorated with marble statues of the Virgin Mary along with figures of Saint George, Saint Theodore, the Evangelists, the Prophets, Judith with the head of Holofernes. As your Vaporetto turns towards St. Mark Square you get a glimpse of the island church, Santa Maria Maggiore which stands opposite the great square. San Giorgio Maggiore was designed by Andrea Palladio in 1566 in classical renaissance style. The white marble facade gleams against the blue waters. The red brick buildings surrounding it, along with the bell tower, mirror the campanile in St. Marks Square. From the top of the tower, there is one of the most stunning views of the city. Our final destination is St. Mark's Square, the drawing room of all Europe. Approaching it from the waters you get an incredible view. I was on pins and needles as the boat pulled into the docks and we were let out to explore this historic square. You feel like one of those first European travellers who visited Venice in the Renaissance to experience all the wondrous art and culture which Venice was so famous for and still is to this very day. While there is SO MUCH to explore on land, taking this journey down the canal is the perfect introduction this city built on top of the water and the magnificent architecture which transformed the city into a dreamland unlike anything you've ever seen before.